This very large reverse apex shed has a very unusual design. If you’re looking for a traditional style building then this definitely isn’t for you. However, if you’re looking for a wide, spacious area to store all of your gardening essentials, we would recommend considering this model. In terms of cost you are offered outstanding value for money. However, one thing you do need to be aware of is the solid sheet floor. Now this is great for storing lightweight tools, equipment and plastic furniture, but it isn’t going to be able to cope with larger, heavier items. You can enhance the floor by adding your own additional solid sheet of wood, but this will push the cost up and require minimal DIY skills. One large styrene glazed window is fitted at the front of the shed. What we like about this is that the building gets to benefit from some natural lighting without compromising its privacy too much. It is slightly unusual to find a single, rather than double doors added to the shed. A building of this size would usually come with double doors. However, the single door has a very wide design which means you still benefit from generous access to the interior. Solid sheet floor and roof lowers the overall quality. Upgrades can be made but it will require minimal DIY skills. 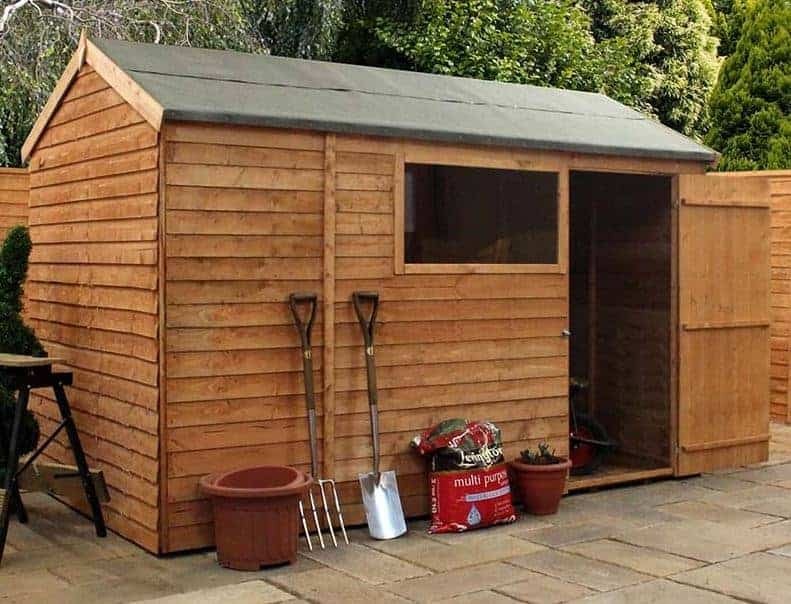 This is more of an entry-level shed designed for basic, lightweight storage. If you’re thinking of using it as a workshop then you will want to add an extra wooden sheet to make the floor a lot more solid than it currently is. When a shed is advertised as 10’ x 6’, usually it is the depth that is the larger measurement. However, with this building it is actually the width that measures 10’4”. Therefore this isn’t going to be suitable for gardens with very little width available. The door opening height is pretty short for an apex shed, though the height once you get inside the building is a lot taller than most. You are also given a lot of width to enter the building thanks to the door’s wide build. The signature feature of this shed is the reverse apex roof. It gives it an entirely different look to traditional sheds yet it still offers an incredible level of rainwater protection. It is disappointing, though not surprising, that the roof and floor are made out of solid sheet board. Whilst this is reliable, you’ll notice it is really thin. For that reason many people choose to install roof joists and strengthen the floor of solid sheet sheds. Without extra strength, it isn’t advised to store anything heavy in this model, or to use it as a workshop. Overlap cladding is widely used due to its reliable yet affordable benefits. Sheds created from overlap have a distinctive, rough look that isn’t to everyone’s tastes. Panels built with rough-sawn timber overlap to create a weatherproof construction. One thing we will point out is that overlap sheds usually measure 8mm thick. This one measures 7mm thick so it is slightly less durable than a lot of its competitors. Saying that, if treated properly you should find it is more than capable of withstanding the UK’s unpredictable weather. A rough sawn 28mm x 28mm frame is found throughout the interior. Again, compared to a lot of competitor sheds this is slightly inferior. The thickness of the frame is standard, but the rough-sawn design means there is a risk of splinters, it doesn’t look as flawless and it isn’t as moisture proof as a rounded frame. This shed will need to be treated on a yearly basis. Annual treatments will ensure you benefit from the 10 year anti-rot guarantee and protect it against discolouration as well as keep the walls waterproof. 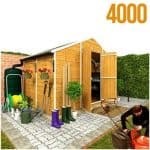 The good news is Shed Store supply a free tub of treatment with this model to help you save further money. Whilst there are many things that could be improved with the design of this shed, the doors and windows aren’t one of them. Both have been factory fitted which means you don’t have to worry about assembling them. This saves a lot of time and hassle. There is just a single door situated on the front corner of the shed. This isn’t braced but it wouldn’t be too difficult to do this yourself if you feel it is required. The fixed shatterproof styrene window is also placed at the front of the shed offering better lighting and a more aesthetically pleasing style. The single door is secured with a pad bolt, but you will need to buy a padlock to keep it locked. Shed Store do offer pretty good quality alarm padlocks which we would recommend, but they don’t add them as an extra. So you will need to browse for one separately. Though a window is incorporated into the design, it only allows part of the shed to be viewed from the outside. So the privacy of the building isn’t completely compromised. Unfortunately there isn’t anything you can do to really change this as the overlap cladding won’t support anything being installed onto it so hanging curtains for example isn’t possible. 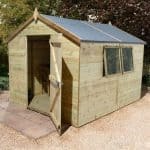 As with some of the other sheds offered by the Shed Store that feature pad bolts, we’re surprised this one doesn’t offer a padlock as an extra. Instead, they offer two things that aren’t really required. The first is a DIY Assembly Assistance Tool Kit. Whilst this does contain many useful tools like safety goggles, a hammer, saw, safety knife and brushes, it isn’t really an essential purchase. The other extras available include treatments. Now a free treatment is provided when you buy the shed, but due to the size of the building an additional treatment would be worth investing in. There are four different coloured, environmentally friendly treatments on offer. You can use either a paint sprayer or paint brush to apply the treatments and the choice of colours enables you to really personalise the building. Compared to other overlap sheds, this is offering a slightly lower quality. The materials used could be thicker and if you’re looking at storing anything other than basic tools and equipment it will not withhold the weight securely. Despite being made from slightly lower quality materials than many other overlap sheds, this one still offers a 10 year anti-rot guarantee. You just need to be strict about keeping up with its annual treatments. 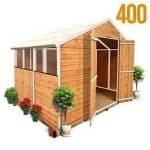 This is one of the larger sheds on the market and therefore it provides a substantial amount of storage space. However, full marks cannot be given as it isn’t possible to install shelving and the floor isn’t strong enough to support heavy storage units. The installation of the shed has been made easier thanks to the factory fitted door and window. The size of the building does mean it will take at least one afternoon to put together. However, the process itself couldn’t be simpler. 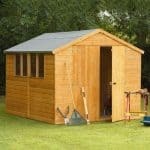 A number of things could be improved but overall this is a very good value shed. We’d largely recommend it to those with very basic storage needs. 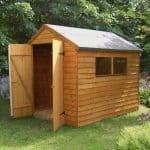 Final Thoughts: This is one of the more unusual 10’ x 6’ sheds we’ve reviewed. Not only is it unique because of its great reverse apex roof, but it also has an extraordinarily wide design. Obviously this means it won’t be suitable for gardens with more depth than width, but if you do have the space then this is a great model to invest in. 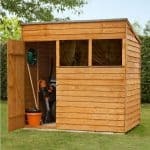 The main focus has been on creating a spacious shed that doesn’t break the bank. Therefore overlap and solid sheet materials have been used. It is a simplistic build that is mainly suitable for those with light-medium weight storage requirements.